Since I’ve now updated our Complete Maps, I decided to go through each chain and pick out the best deals. The idea is that category 1 hotels can cost a fraction of the top tier hotels, and yet some are actually really nice or in great locations. For example, you could get 19 nights at a category 1 Hilton for the price of 1 night at the top tier… and that’s before 5th night free. And still 9 nights of a category 2, which actually has decent hotels. Generally, these are hotels I would actually want to visit because of the hotel and destination. Maybe I wouldn’t go back and spend a lot of time in Jakarta, but I seem to layover there a bit, so I included it. Holiday Inn Express : Quito ? Holiday Inn Express & Suites : Medellin ? Holiday Inn Resort : Phuket Mai Khao Beach Resort (I don’t like Phuket, but if you fly in, this is a remote oasis). Let me quick say that the Sheraton Dubrovnik for 3,000 SPG points (on weekends) is an amazing deal. Friends have said it’s awesome. The picture is from Bart.La – whom I got to see show it off on instagram/snapchat. Protea hotels all over Africa! The HR Düsseldorf is only Cat 3 – that’s quite a steal for this modern HR. I would also recommend suite awards at the Hyatt Regency Dusseldorf, they come with lounge access and breakfast in the restaurant. Awesome list!! Highly recommend Hilton Garden Inn Hanoi for 10k. Vote to add Hyatt Regency Danang for 12k. I second the HR Danang. If you’re upgraded to a club room, with free breakfast, snacks, and happy hour which is enough for dinner, you don’t need to leave the property or pay for anything. And you’re on China Beach. The room was great too. Would love to see the same map for people driving in the US. As in great value hotels for a road trip in the US. Currently, I need to click through all your chain maps when driving the family somewhere. Thanks. We use awardmapper, restrict the number of points and search along my route. I love AwardMapper but it isn’t regularly updated. Closed hotels still appear on maps and newer ones are missing. Such a shame. You should really add the Hampton Inn Mexico City to the list of great value Category 2 Hiltons. It was $135 for when we were there last week, so 10,000 Hilton points is a great value. It’s a Hampton, so it’s not fancy, but it is in a historic building just two blocks from the Zocalo, so the location is fantastic. The seafood restaurant onsite is excellent and affordable. Also, I noticed that you have the Grand Hyatt Amman on your list. I’m going to AMM in a week, and I’m staying at the Marriott, because 15,000 Marriott points seems like a lot less than 15,000 Hyatt points. What am I missing? Should I try to switch? We stayed at the Hyatt in Amman (not 15,000, 12,000) using points and cash and suite upgrades. It was very nice, although I haven’t experienced the Marriott, so can’t compare. This past October I used 10,000 SPG points for 3 nights (thur-sun) at the Aloft Guadalajara. I felt like it was a great deal at a really decent property that is new and in an excellent part of the city. Hampton Inn Guadalajara at Plaza Del Sol. 5 nights for 9000 each night. Very new hotel in a great location for next time. Great list! JW Marriott in Hanoi is phenomenal with incredible breakfast, lounge and service, although it’s a bit far away from the city center. My cousin stayed at Garden Inn, which was very central and perfectly fine. DT in Kuala Lumpur is a great central hotel for the price with excellent breakfast, 10-15 minutes on foot from the Towers, but I thought the lounge was so-so. I think Panama City hotels are missing from the list. There are quite a few low-cat. properties including Hilton, Hyatt, Marriott, and I think even SPG, IIRC. HI Suva- there is really not a lot to do in Suva, really only worth it if you have to stay overnight to catch a plane or ferry somewhere else. But nice property for sure. No beach. HI Tbilisi- Sort of a weird location, I’d rather stay somewhere closer to Europe Square, prolly on the other side of the river. HI Sandton- well, if you are going to be stranded in J’burg it’s not a terrible place. 2 blocks from the Gautrain and they upgrade to club for platinum. Make friends with the Qatar airlines pilots staying daily who get free SA wine and nothing better to do with themselves. The hotel itself is nice. Did you guys go on the tethered hot air balloon in the park nearby for $8? I did 🙂 Also the shopping mall is not so bad at xmas, they had a circus and all sorts of music performances going on there. Downtown Dubai is a great location, only issue to watch out for is nasty dudes ogling you from the building over if you decide to sunbathe by the roof pool. Also a note about the HI Vanuatu- it was wrecked in Cyclone Pam, it was closed when I was there a good year and a half ago. Fingers crossed they did a nice renovation there. The people of Port Vila were lovely. I stayed at Club Carlson in Frederick, MD for 15000 points. Free breakfast, upgraded to a large suite. It was a good deal IMO. I had some stuff to do in DC this place looked close on the map but it wasn’t really that close. The drive was pleasant, however. Fall foliage and all. Awesome list! Something I’ve been looking for for sure. I’d also suggest the Holiday Inn Sydney Waterfront (Sydney NS Canada), which for 10,000 IHG points is an awesome value IMO, especially for Canada! Been thinking about visiting this area and thought 10k for that location is a great offer. Slightly of topic, but not really. Marriott Resort Hotel Costa Rica at San Antonio Belen. Fantastic use of the 5 or 7 night certificate will have when you redeem Marriott Rewards points for the Nights and Flights package, plus if you use that option to get your Southwest Airlines Companion Pass in January you will also have plenty of points to fly to SJO as SWA flies there from Houston. The airport is modern and Uber is readily available to the hotel which is fantastic! I rented a car, but next time I won’t as traffic is horrendous. Tours leave directly from the hotel and uber is cheap compared to the “bargain” you will think you are on a rental car. ($36) for the week. SURPRISE: You must pay mandatory insurance which was an additional $300!! Don’t be thinking they will accept your credit card car rental insurance because they won’t. Oh, I almost forgot. Get the Platinum AMEX for SPG Gold thereby conferring Marriott Gold through status equality when connecting accounts. This will get a free breakfast and free food (enough for dinner) and non alcohol drinks in the exec lounge. This will save you a bundle on a seven night stay for two!! Yeah, I thought it had changed. Just a personal opinion, but if I had the points to spare, I would stay elsewhere. We stayed there last June. It is okay and quite a steal for 10,000 points, but we wouldn’t stay there again at twice that. Okay, not great, if you are using the subway, horrible location if you are using a car. I use the HR in Tokyo quite often, can’t beat the value in an otherwise expensive (for hotel redemptions) city. Also stayed in this one, using 20,000/night for suites. Very good value for great suites in a very good location, if you can book them. The Hilton Colon in Quito, EC (and probably the one in Guayaquil as well) is in a great location and as far as I could tell was probably among the nicest in the city. Not bad for a Cat 4 and 20k points during my visit. Great list and post! 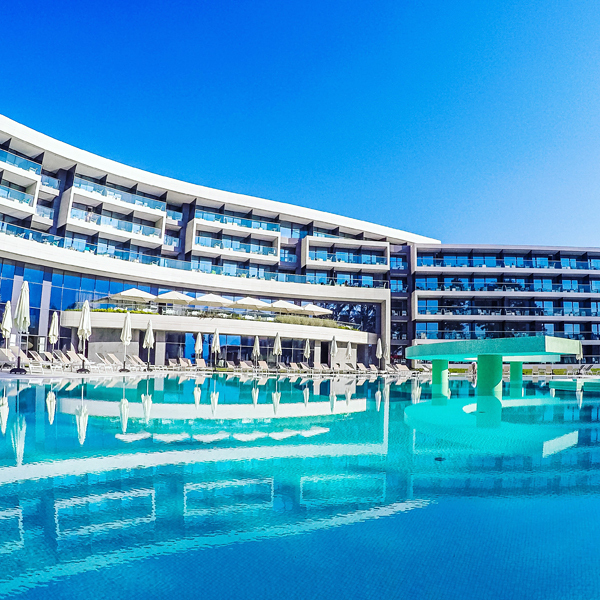 A nice hotel to add would be the Hyatt Regency Thessaloniki (saw you had the Holiday Inn one here). It just changed to category 2 this year and is a steal for value – especially compared to the Holiday Inn property here (really no comparison!). Also, I really miss the old Le Meridien at the Dead Sea. Great value with SPG points! Agreed on the Hyatt Regency Tokyo, good hotel in a good location in an expensive city. The standard rooms aren’t luxurious at all, but it’s a Regency. I just stayed in the other JW Marriott in Beijing (cat 4) which is FANTASTIC. It was on sale for 15k per night, so same price as the Central on your list and from what I’ve read the location is better. That’s a great hotel. Hyatt Kathmandu is awesome for category 1 property. Call hyatt to book 3 night suite (with regency club acccess) for 21k points total. I’ll stay there again this or next month. Just stayed at the Holiday Inn Resort : Phuket Mai Khao Beach – it was a great value. As Drew mentioned, it is north of the airport, away from the busy parts of Phuket. As a Platinum member, I was ungraded to a third floor two room suite with two balconies overlooking the pool and ocean. There just outside of the hotel there are several local restaurants, as well as massages and a laundry service which were well below the prices charges at the property. Great place to spend a few quiet days. Nice. What were you upgraded from ? A standard room or had you booked the room category just below the suite ? Recently stayed at JW Marriott Pune for 10k points, and Conrad Pune for 30k points. Both great deals. Also Kochi Marriott (now 10k points). Did three nights at Park Hyatt Chennai. And two nights at Intercontinental Mumbai for 25k points. Thanks for the list! I know I will use it. Thought I would comment that the Park Inn Meriton in Tallinn is in a wonderful location, but is huge and is worn. We stayed on points early part of June 2016 so maybe they gave us one of the older rooms. It had a sauna in it!!! But the room was tired, as were the hallways and lobby. It is a strange place and has a weird conglomeration of restaurants. Price and location were great though! Hangzhou is one of my favorite cities in China. We liked it better than Suzhou for sightseeing and restaurants. Stayed at a Cat 1 Four Points Sheraton there in 2013, with exemplary (IMO) service and quite nice rooms. Downside is that it’s in the business district (BinJiang) on the South side of the river, and most of the attractions are on the North side, necessitating a taxi ride in the 30 or 40 yuan range (like USD $7 or $8), in a town somewhat short on taxis.